Time goes by so quickly, and what an amazing summer it’s been. 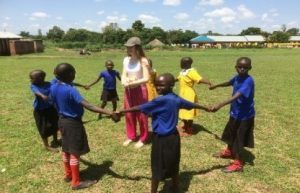 In June, a return trip by our friends from Maidstone and in August a team of 18 of us made a visit to our school and the surrounding rural areas of Northern Uganda, we thought you’d like to hear some of their comments on different aspects of their trips. Clare and Ross Fagg write We returned to Bethel Christian School in June this year for 4 weeks. First stop Kampala where we collected Afripads for all the girls in the school that needed them. A big thank you to Maidstone Riverside Rotary who funded this. 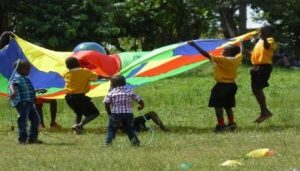 A big thank you to Pete and Julie for providing much needed desks for children who were sitting on the floor and to Sue Webb for provided a parachute which the children loved playing with. We spent our time at Bethel school: adjudicating for their two and half hour-long exams, which was challenging for us let alone the children! Putting up 100s of meters of washing lines to try and extend the life of their clothes and mosquito nets; which were being torn on barbed wire fences, teaching the children, giving health talks with Gloria, the schools very dedicated nurse, doing school assembly, making videos and taking pictures of all the sponsor children with much needed help from Collins, playing games, singing songs and having fun with the children. Sadly, we find ourselves in the position of having to step down from the role of sponsorship co-ordinators, but know that the school will continue with its important and inspiring work. Dani Writes What incredible things we are seeing from Bethel Christian School. The school is going from strength to strength. With new exam results back this month, showing that all the hard work and dedication from the teachers, children, families and community had paid off. The schools strong visons and values shine through in everything they do. I have the honour and privilege to tell you a little bit about this fantastic school and the people that support it as I have recently returned from visiting them. As a team of 18 we went to the school with many of us not really knowing what to expect. All with differing skills and attributes nevertheless we were all eager to help and spend time with the children. Jan, Andrew and I taught in different capacities in the classrooms. We had some amazing support from Megan, Jacob B and Jacob L. We lead Literacy, Maths, Social Science and Physical Education. The children loved to see all the new resources which were donated to the school including footballs, rackets and cones. What an eye-opening experience to teach in a classroom with so many smiling faces eager to learn and to meet their new temporary teachers. Each day starts with a welcome song and children introducing themselves. We helped give out breakfast which was a yummy porridge, Jackie and Fiona had a great time scooping it into cups for the children. The younger children have fun ways throughout the day to support their friends with their learning. It was wonderful to see the community spirit and the support for their fellow friends throughout the whole of the primary and secondary schools. The children P1 where I spent most of my time received teddies and wrist bands from the team, they children loved their gifts and we managed to give some to the teachers who also stood excitedly in the cue waiting! Lunch was a yummy affair which we joined in with each day. Beans and Posho (cornmaize mix) was the meal of choice every day, where the team took in in turns to serve up. We thoroughly enjoyed eating it with our hands and although very different to begin with, it became second nature to some of us by the end of the trip. 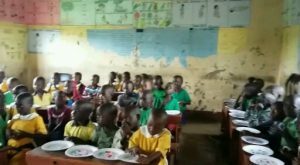 Between the singing, dancing, drama and bible study the team were able to meet some amazing children and teachers at the school, so much so that many of the team are now sponsoring some of the children through the GMI sponsor programme. We had the most amazing time at the school and feel that we were able to have a great impact on the pupils and teachers, this was confirmed in the final assembly which the children and teachers had organised. The children sang the Ugandan national anthem and sang songs of friendship just before Steve and Simon gave a message to the children and Sam lead the favourite song of the trip this little light of mine on his guitar. Finally, a very special moment at the end of the assembly came where the whole team were awarded certificates for their help by the Head Boy, Head Girl and the Head teacher. We have made lasting friendships at the school and I know I cannot wait to go back to see them! A great team of lead builders including Dave and Eli made great head way in the first few days building the entrance wall for the school. Once built Alison’s vision for the moto and beautiful mural came together. Allison lead the whole team in painting the mural which as you can see turned out to be a long-lasting memory of our time at the school. She even managed to sneak our names onto the wall for the children as a reminder of who came to visit. Allison writes It’s amazing to see the transformation of the primary school entrance in the short time we were in Gulu. 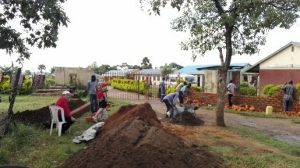 In the space of 10 days a wall was built either side of the entrance gates, by a team of locals plus a couple of our UK team. Once the walls were rendered we sanded them down and painted 3 coats of white paint. The next step was to draw the outlines of the design, and then paint the mural using weatherproof colours that we’d had specially mixed by the DIY store. We were really pleased by the final outcome and it was very well received. It will bring much joy to the children and staff of Bethel School. We also spent a couple of days painting the interior walls of a classroom and offices at the new secondary school building. Andy writes As part of the holiday club we ran at the primary school, we organised for various classes to do some games for half an hour a day. On first arriving, we discovered that the children generally played football and netball, which meant that there was very little equipment. Fortunately, we had taken a case full of sports equipment with us, so we were able to do a variety of fun games and skills practice from under and over with a ball, to throwing, rolling and catching. Just now and then we’d allow a bit of footwork! Megan writes I was lucky enough to be given the chance to experience what it was like in a Ugandan health centre. The centre had two main buildings, one was a maternity ward and the other was a general building. The general building had a doctor’s office, a lab and one small room that contained a pharmacy, a treatment area and beds. 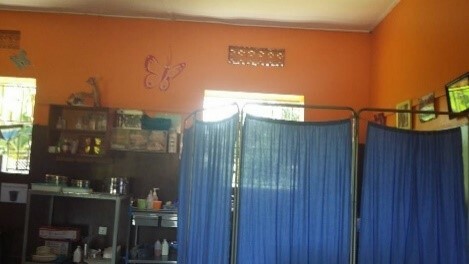 They treat about 30 patients a day but last year they had 1500 patients a month in the malaria epidemic. The centre is private so the patients have to pay about 20000 Ugandan shillings for one treatment. This is about £4.50. Those who can’t afford it have to go to a public hospital, but they still have to pay for all the equipment the doctor needs, even water! The hospital was also used as a safe building to stay at night during the war. As most people can’t afford to go to university straight after school, the doctors and nurses train for their certificate, then their diploma before going to university to get their degree. Between each stage they work to earn money to move onto the next level. 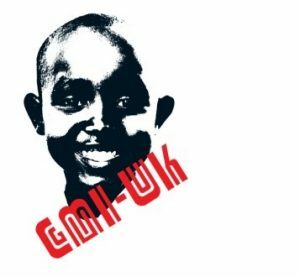 All the doctors were GP’s, as if they specialised no one could afford to pay them for their level of expertise, meaning they would have to move abroad. All the doctors and nurses were very excited to show me their anti-malaria tablets and were keen to learn about the similarities and differences in vaccination in the UK. I was very well looked after and thoroughly enjoyed my time there. Jackie writes During our time in Gulu we spent 2 days visiting the local villages to talk to families and share with them the good news of Jesus. It was hard to see people living in so much poverty. The homes were mud huts and the majority of the families grow their own crops and keep chickens, goats, some also had pigs, ducks, cats and dogs. Every family we met were all so welcoming, they would invite us to sit outside their huts, bringing a bamboo rug and the few chairs they owned. 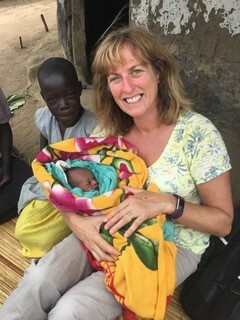 One of the families who had 9 children brought their 2-day-old baby and asked us to name her; we gave her the name Faith. Another family asked us to name their 3-week-old baby boy, which we named Samuel. It was such a privilege and humbling experience. As we walked through the village the children followed us, none of them had shoes, their clothes were dirty and torn, but they were all happy and excited to be with. We visited several families, each family welcomed us, took the time to listen to us and many asked for prayer to give their lives to Jesus, prayer for healing and finances. Karen Writes The marriage conference was held for 1 day at Soul Gospel Church, and led by Rev Simon and Karen Jennings, and input by Andy Bowdler. There were over 100 people there, mainly couples, and some without their partners. It started with worship, which was awesome. Pastor James spoke on building your marriage on the Rock and if storms come, we shall still stand because our foundation is in Jesus. We opened the session with some icebreaker questions which was fun. We wanted it to be fun and relaxed, but also the importance of building a healthy marriage with sound biblical teaching. Simon shared how to keep a marriage healthy by having good communication, trust and unity in your relationship, and building your marriage with God at the centre. We even did Mr & Mrs game with them which translated very well. We had an opportunity to pray for the couples, Simon asked if anyone wanted a prayer blessing at the end, and if so that We would pray for them. We were pretty shocked as pretty much most of the people there came forward for prayer, it was such an honour to pray for them. It was such a fun filled day, and empowering truth that God loves marriage and how to keep it healthy and alive. We gave them encouragement, and also shared with them how to use the ï¸love languages in their marriages to bless each other, and praying together as a couple is vital in marriage, it keeps the marriage strong and healthy. We both enjoyed the day, such a blessing to us also.